Last night, Harbaugh-to-Michigan rumors reached a critical mass. Twitter, premium message boards, blogs were all swirling with news/rumors that Jim Harbaugh has reached a deal with Michigan. As of right now, those rumors are just that…rumors. However, things do appear to be happening. And if you're Michigan, those things are trending quickly in a positive direction. The prevailing rumor, again…rumor...is a 7 or 8 year deal worth $49 million has been reached between Michigan and Harbaugh. Rumors also exist that possible coordinators have been contacted/named. Both could be a little premature so we won't go too deep into that right now, but the fact that no one close to the Michigan program – media or otherwise has come out to deny it is telling. The only thing being denied by anyone, Brandstatter in this case, is that they aren't the source of the information. Again, people are denying being the source, not denying the information. That means something. It has been speculated that an announcement could some as soon as today. TODAY!!!!! That's like, any minute now! But in all seriousness, if you put a gun to my head, I don't think we hear anything official about Harbaugh for at least 12 days even though it appears things are happening beneath the surface. In related news, LSU's Les Miles has come out and denied rumors that he is a candidate for the Michigan job. "Miles declined to be quoted directly but made it clear he is not seeking the job and has not been contacted personally, or through his agent, Dallas-based George Bass, formally or informally." This appears to contradict rumors (per Scout's Sam Webb) last week that Les had been contacted but not offered. Miles said this "off the record" yesterday, which of course was leaked out anyway…so take it in the spirit in which it's intended. With both Harbaugh or Miles, no one knows exactly what to expect until it actually happens. This is a situation that could change in a heartbeat. Some cold water: got a lengthy note from a source who is second-hand but has had good info during coaching searches past that is basically a re-iteration of the NFL reporter position that Michigan's chances are slim at best. I believe the guy, and believe the NFL reporters to some extent—there is clearly a story out there in which Michigan is the wallflower hoping to get noticed by the prom queen. There was a credible-seeming Cassandra on Rivals offering up a similar story about how this isn't happening and was never happening. Some of this is from people who swear Harbaugh wants to remain in the NFL. Some of this comes from within the Michigan base. It would look pretty bad for Brandon if Hackett did lock Harbaugh down, and it was mentioned to me that he is hoping it doesn't happen. He could be a negativity vector there. That would be the best case scenario for this undercurrent of NOPE amongst the cresting wave of euphoria for the same reasons Jack Harbaugh might be overly enthusiastic. 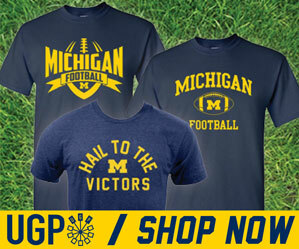 It is hard for me to reconcile the piles of internal optimism with the idea Harbaugh is just stringing Michigan along. There would be a way to approach this without giving everyone the impression it's happening dot gif. On the other hand, this is a credible person. There are people close to Harbaugh who think it's not happening dot gif. Many someones are about to be very wrong. Yes they are, and if Harbaugh does indeed snub the NFL for a ridiculously lucrative college coaching contract, this will fly in the face of everything the so-called NFL experts know about college or NFL coaching searches. But that's not exactly their fault because should Harbaugh come back to Michigan, it will undoubtedly change the landscape of NFL vs college coaching opportunities. My limited knowledge is…limited, but I can't remember a current NFL coach with seemingly numerous NFL openings being offered to him deciding to go back to college. I get that it would be truly landmark decision, so I can't blame the NFL insiders for not predicting something like this. We do know that Harbaugh loves Michigan. That is a fact, and it would seem ridiculous that Harbaugh would so willingly string Michigan along in order to raise his NFL stock. He simply doesn't need to do that. With all the Harbaugh/Miles madness, there is one name still getting passed around by insiders and that is Oklahoma's Bob Stoops. Some out there will tell you that Stoops is waiting in the wings should Harbaugh decide not to come. Stoops is getting a lot of traction nationally as well (I'm sitting here listening to The Dan Patrick Show and DP is saying Stoops to Michigan has some merit). If in fact Stoops is a backup plan, that could be one helluva backup plan.